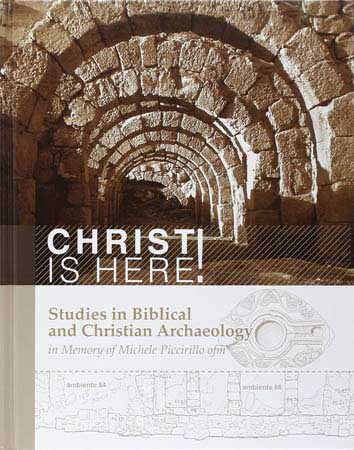 Dedicated to the memory of Michele Piccirillo, O.F.M., a priest and friar who committed his life to archaeological research, this compilation includes studies ranging from wall paintings in the Abbey of Saint Mary in the Kidron Valley of Jerusalem (Crusader period), to the architectural reconstruction of the Church of Bishop John at Khirbet Barqa (Byzantine period), map mosaics depicting sailing in the Dead Sea (Byzantine period), and inscriptions in Elijah’s Cave on Mount Carmel (ninth century BC through the twentieth century AD). I will consider only the research on Elijah’s Cave, composed by Asher Ovadiah (Tel Aviv University) and Rosario Pierri, O.F.M. (Studium Biblicum Franciscanum). The article is broken into two parts: first, a description of the cave and its meaning, and second, an examination of 22 carved inscriptions of the 180 total inscriptions. Situated on the northwest slope of Mount Carmel, Elijah’s Cave was the original asylum and oratory for Elijah and his early followers, and where he prepared for the encounter with the prophets of Ba’al.6 The cave is in the shape of a parallelogram, measuring forty-seven feet long, twenty-eight feet wide, and fifteen feet high. Cuts in the stone walls and floor indicate that the cave was enlarged and improved throughout antiquity. A second rectangular room, or secondary grotto, is attributed to the cell of the Prophet Elijah. Eight pages of the study are excerpts and analysis of historical literary sources mentioning Elijah’s Cave. The earliest written record of the cave, surprisingly, is from the twelfth century, when the Russian “Abbot Daniel” refers to the cave as part of his pilgrimage to the Holy Land in AD 1106. Part Two of the work by Ovadiah and Pierri describes the twenty-two best-preserved inscriptions in Elijah’s Cave. The authors methodically analyze the names (graffiti), their dimensions and geographic origins, their translation, and their interpretation. The typical inscription (in Greek) reads something like “Remembered be Alaphaios (the younger), remembered be.”7 The epigraphic content of the cave is one of the richest troves of Greek inscriptions in Israel from the first through the sixth centuries AD. But unless one is an archeologist or is intrigued by variations on names and lettering in antiquity, the detailed analysis is lackluster. One fragment of artistic interest that remains is the foot of a colossal marble statue, the rest of which has been lost. It is believed to have been a figure of Zeus of the Carmel from the second century AD, which could have stood within the apse niche of the cave. Thomas D. Stroka is an architectural designer in Indiana. 2. Ovadiah and Pierri, “Elijah’s Cave on Mount Carmel and Its Inscriptions,” 33. 3. Barbié du Bocage, Alexandre François, Dictionnaire Géographique de la Bible (Paris: De Crapelet, 1834). 4. Ovadiah and Pierri, 38. 5. The Discalced Carmelites of Boston and Santa Clara, Carmel: Its History, Spirit and Saints (New York: P.J. Kennedy & Sons, 1927), 168. 6. Introduction, Rule and Constitutions of the Discalced Nuns of the Order of the Most Blessed Virgin Mary of Mount Carmel (Madrid: Arganda del Rey, 1990), 22-23. 7. Inscription n. 80, Ovadiah and Pierri, 59.